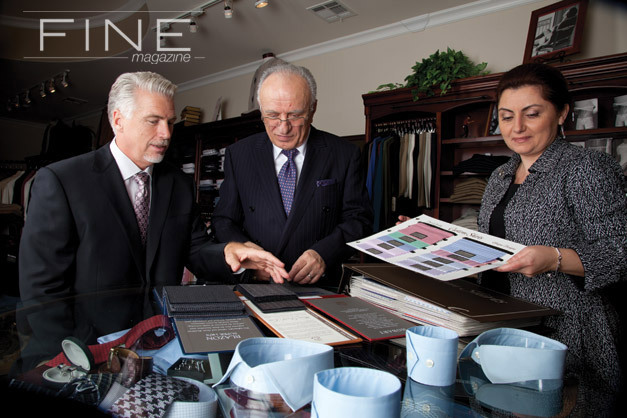 expertise as a master tailor, Gary Sanfir – proprietor of GSB Men’s Clothier, a European boutique for men’s fashions in Rancho Santa Fe [since 2008], along with his wife, Bella, are widely known and respected for their craft; a notion echoed with recent accolades including “Best of: Men’s Clothing Store” from a number of local publications. In getting to know more about the master tailor and his craft, here is a recent conversation between FINE magazine and Gary. Q: Tell us about yourself and your background. Gary Sanfir: My family has always been involved in the fashion industry, so naturally I grew up around various fabrics and designer outfits. My father owned a large scale production and distribution factory of men’s clothing and when I was 13-years-old, he arranged for me to learn from the best tailor in town. My grandmother would sew amazing outfits at home and so as a young child I was always trying to imitate her creations. It was the 1960’s and gentlemen would only wear custom-made tailored clothing because wearing factory clothing was considered low-class. By the time I turned 15, I was sewing clothes for myself and a few outfits for friends. I would experiment and redesign my dad’s old shirts, grandpa’s linen suits, fabrics for shoe insoles, etc. I’ve been involved in fashion and men’s clothing all my life, tailoring for top designers and men’s clothing stores in Europe and Los Angeles, and working with a host of celebrities, models and professionals; until I finally had a chance to open the first GSB retailer in Los Angeles, and now we have one in Rancho Santa Fe. Q: What brought you into the tailoring trade? Sanfir: After graduating from the university with a degree in business, I began to manage my father’s clothing factory, and had a lot of success; but naturally, I wanted to expand, and do something more creative and use my own hands. 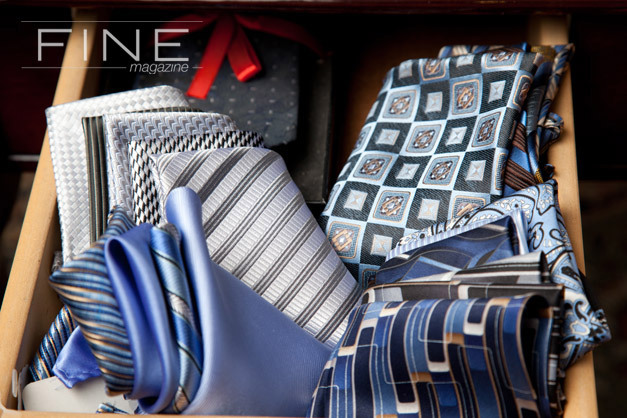 a tremendous success, because I completely redesigned the more traditional ties into high-end fashionable items. Fashionistas from all over the country wore my designs and each installment in the “Ties by Gary” series was highly anticipated. Q: What is most rewarding for you? Sanfir: It’s a real joy to see our clients looking amazing in their suits, and seeing how happy it makes them is also incredibly gratifying. Clothes can make a strong impression on others, so of course, it is nice to help people make a good impression. Also, when our clothes are featured in magazines and on television, we feel rewarded because we are growing and more people are learning about our store and services..
Q: How has tailoring changed over the years? Sanfir: Since the 1950s, ready-made clothes have replaced the “hand tailored suits” in the majority of men’s clothing trends. The fast pace of modern city life has made it difficult for customers to go back and forth to a tailor five times for fitting, and to wait over two months for items to be tailored. As times changed, men have gradually come to accept clothes and designs that are ready-to-wear. In response to this new demand, most of the attire available through the store is ready-made for the convenience of our customers. These ready-made suits are stitched together from the world’s finest fabrics, and come in sizes to fit any body type. We think it is of the utmost importance that any customer who walks into the store should be able to find the clothes they need immediately and, most importantly, that they have access as well to the feedback of any staff in the store. While technology and the emergence of mass-production clothing manufacture systems have had a significant impact on the tailoring industry, celebrities and fashion magazines have done much to restore the demand for tailored clothing. This trend is actually growing now, and more and more designers are introducing “couture” labels. 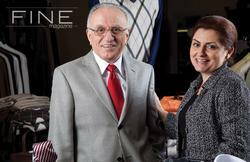 Q: What are the advantages of having a tailor over buying machine made clothes? Sanfir: I’ve had clients tell me they felt 20 years younger when they put on our suits, and others have said that the suits helped correct their posture. Customers say that my suits give them another avenue to express their individuality. Q: What is the difference between Italian and American/English approaches? Sanfir: Well, they are certainly both distinct, though each has borrowed heavily from the other. It all began in Great Britain and later in Italy, and everything else was a derivative of these two. British designers dominated the scene until the mid-1950s, and known experts of men’s fashion [would] only shop at stores located in the affluent Savile Row in London. The motto of the British tailor has historically been “nothing personal.” A suit would take the exact form of the host, and not much personal information would be exchanged between the tailor and the customer. The fit would be exceptional, and the suit would be made from the finest fabrics and the best patterns. After World War II, Italian designers — especially those in Rome and Milan — began to experiment with the soft silhouetted look, which symbolized the longing for a peaceful time. They aimed at making clothes that projected individuality and strong masculinity. Light and soft fabric, styles in color and figure, and refinements in the cut were all used to manifest elegance, which was the aesthetic priority in post-war fashion. This approach still exists today and has done much to shape industry standards. The American-cut suit originated in the late 19th and early 20th century. It was similar to the English-style suits, but more explicitly preoccupied with comfort. The jackets are shorter than European models, with rounded natural shoulder lines and a pinch at the waist line. Many European immigrants have shaped what is known as today’s American style, but American consumers had the most influence on what styles and designs they were willing to purchase – further boosting the trade for American apparel. Q. How do you do things differently from your competitors? Sanfir: I always consider and treat my clients as my equal partners, and my goal is to see that Q: How do you do things differently from your competitors? their needs are met. We engage with our clients, we invest our time and effort into understanding exactly what the client does or does not like, which helps us cater to their needs and makes their experience more enjoyable and rewarding. Advice from a tailor can go a long way to helping shape a client’s own fashion tastes and preferences, and customers are often encouraged by positive feedback about the way they look. It is very important that customers feel confident about the way they look in their attire. Part of a tailor’s job is to instill this confidence. Customers are our lifeline, and we cherish and reward our loyal customers and always strive to make new clients by offering services such as at-home/office styling sessions and consultations, ongoing promotions, and special exclusive pre-release invitations to preview new arrivals. Q: How do you determine the perfect fit? Sanfir: Please come and see for yourself by ordering a suit, jacket, or shirts and I will personally walk you through the entire process. It is a very meticulous step-by-step process that includes understanding the occasion (formal or casual), establishing a working timeline, likes and dislikes, posture and height correction, and of course, the custom-touch approach to carefully tailoring the needs of the client and their budget. Q: Do you use any innovative techniques to fit your customers? Is there an aspect or technique of the trade that you feel is absolutely integral to success that most tailors generally overlook? Sanfir: My greatest professional assets are my fashion sense and my attention to detail, which are unique to me, and the product of nearly 50 years of experience. 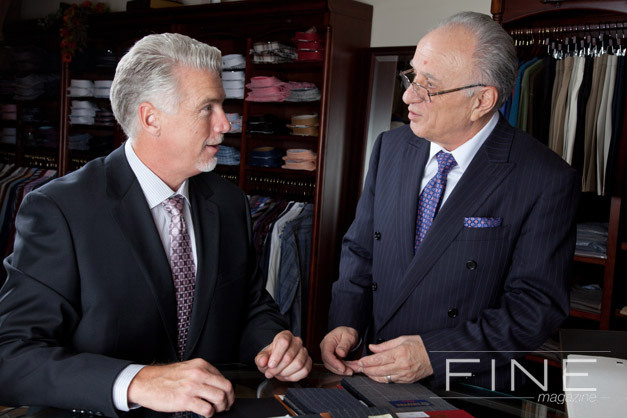 Other tailors overlook the importance of the client’s needs and simply rush them out the door in the attempt to get more and more business, and they miss the most important aspect, which is to custom shape the wardrobe and capture the sophistication of the individual. It’s sad, but true that random people struggle so much in the men’s fashion industry, because you have to be in love with this line of work in order to bring joy to your clients, and I truly appreciate and love my clients and this work.